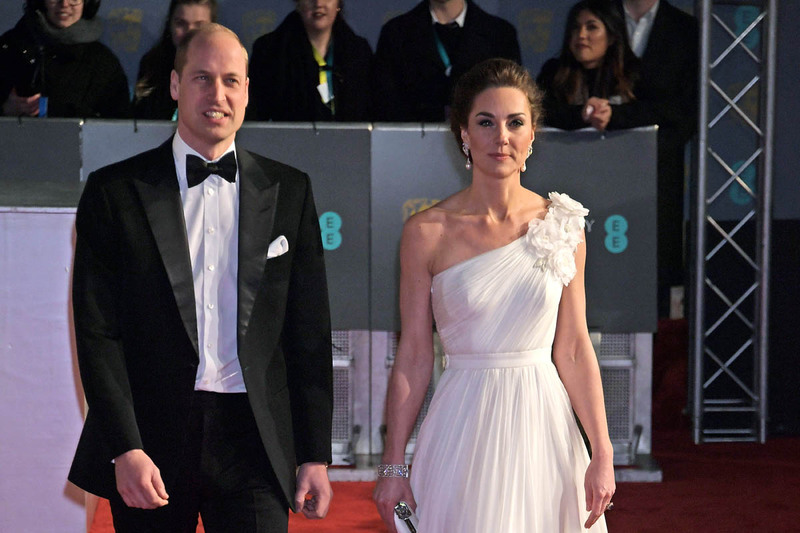 Prince William is the President of BAFTA so this of course is a regular event for him and Kate. They seemed a lot more engaged this year than they were last year at the event, but that’s probably because she was pregnant and did not want to extend their evening. 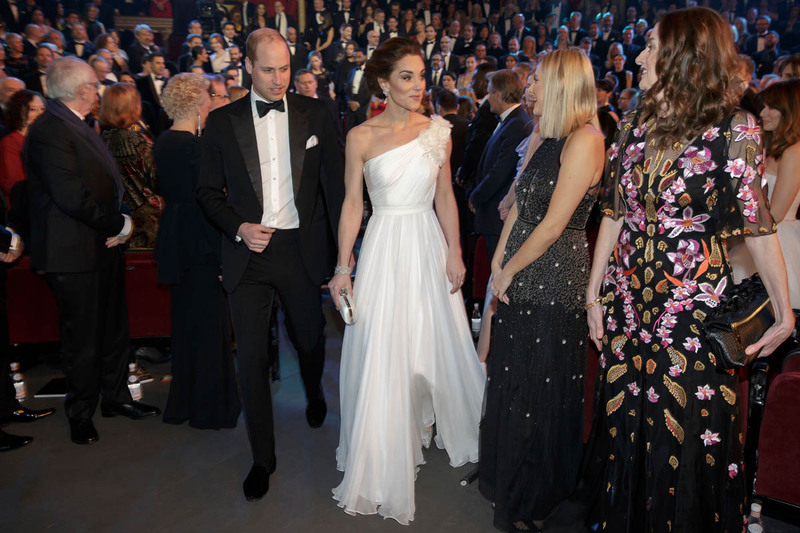 Kate wore an Alexander McQueen dress with an embellished shoulder. What makes it is the colour. This is a dress, I think, that’s only special in white. Picture it in anything else and it’s basically a bridesmaid dress, right? 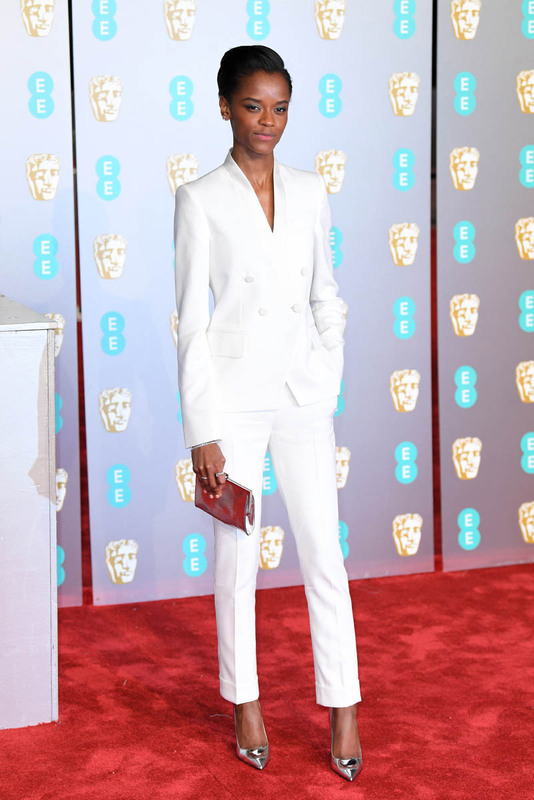 That’s not to say she doesn’t look great – she does – but my point here is that white is the only option for this piece, which means she chose wisely, if there were different options, or it was designed wisely, if McQueen is only sending this out in one colour. The earrings belonged to Princess Diana. The hairstyle belongs in the 80s. And this is what it’s like when they arrive. Everyone has to be quiet as they walk in, knowing that everyone’s just been asked to shut the f-ck up, and I can’t get enough of how awkward it is. Watch Claire Foy’s face – she’s our proxy, or at least she’s my proxy, because I’d be behaving like a kid in church trying not to laugh too (thanks Victoria!). Afterwards, the Cambridges stuck around to meet some of the award winners, including the team from Roma. Here’s where I almost lose it – because check out Yalitza Aparicio. 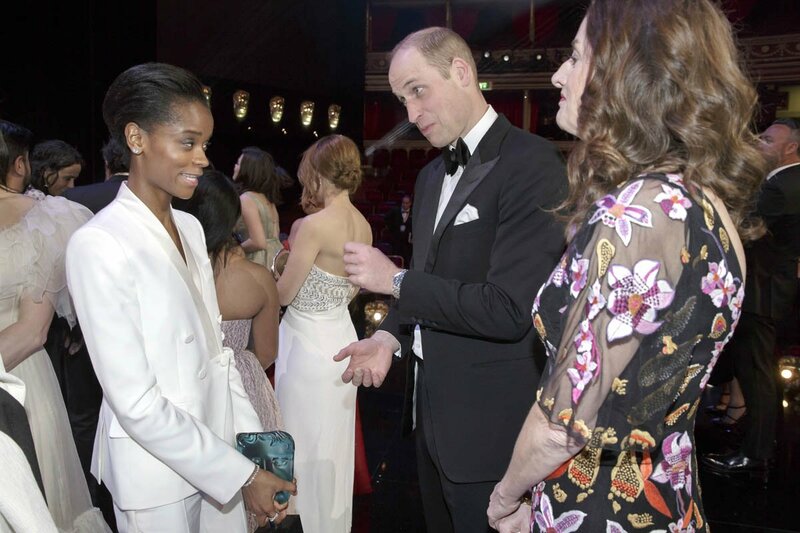 One minute she’s trying to be a teacher, the next she’s starring in a movie, and then nominated for an Oscar for it, and now she’s in London, on the award circuit, meeting Prince William. Can you imagine what must have been going through her mind? What do you think was going through Spike Lee’s mind? As you’ll see below, Spike waited patiently for his turn with Will and Kate. He spoke to Kate first and then, when waiting for Will, at first the look on his face, I thought he was over it. But then when Will gets there, Spike perks right up, seems to get pretty animated. Wish we could hear what they talked about. You can totally hear what he says to Olivia Colman, when he brings up Broadchurch. What’s more intriguing, obviously, is that Olivia is playing his grandmother in The Crown for seasons 3 and 4 which they’re currently shooting back to back. It’s already been confirmed that season 3 runs from 1964 – 1976 so, presumably, it’ll be in season 4 when Diana is introduced and William is conceived. Other star cameos here include Rami Malek and Bradley Cooper. They talk about Lady Gaga who William worked with on a Heads Together promo and it’s here that, I think, he references Letitia Wright’s acceptance speech. Letitia, in her speech, talked about depression, how she suffered from it a few years ago, sharing her experience so that people watching might feel less lonely. Clearly that had an impact on William as he mentions her – I think – to Bradley and also had a moment with her during the meet and greet. Not too long ago, in Davos, he talked about how celebrities weren’t comfortable supporting mental health initiatives. As we’ve seen, over the last few years, more and more celebrities are coming forward with their stories, helping to eliminate the stigma and the shame. Letitia is a beautiful example of it.